1H. Arezumand and H. Zamiri-Jafarian (e-mail: hzamiri@um.ac.ir) are with the Electrical Engineering Department, Ferdowsi University of Mashhad, Mashhad 9177948974, Iran. 2E. Soleimani-Nasab is with the Faculty of Electrical and Computer Engineering, Graduate University of Advanced Technology, 7631133131 Kerman, Iran. 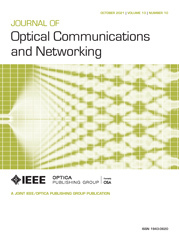 We investigate the performance of asymmetric radio frequency (RF) and free-space optical (FSO) dual-hop cognitive amplify-and-forward relay networks where RF links are subject to independent and nonidentically distributed Nakagami-m fading. We consider that the RF link transmitter and receiver are secondary users of an underlay cognitive network. Specifically, the transmit power conditions of the proposed spectrum-sharing network are governed by either the combined power constraint of the interference on the primary network and the maximum transmission power at the secondary network, or the single power constraint of the interference on the primary network. Also, we consider a double generalized gamma fading channel with pointing error and both heterodyne and intensity modulation/direct detection methods in the FSO link. The closed-form and asymptotic expressions of outage probability for this system are calculated for fixed gain and channel-state-information-assisted relaying techniques. It is demonstrated that the diversity order is a function of the fading severity of the RF link, turbulence parameters of the FSO link, and pointing error, regardless of the interference channel parameter of the primary user. However, the coding gain is impressed by the interference link parameter and RF-FSO links parameters. The diversity-multiplexing trade-off analysis is done for this network, where we show that this trade-off is independent of the primary network.